Developmental Learning: A Battle of Informal Vs Social Learning? Informal learning! Social learning! These are all terms we often hear used interchangeably. Yet each is a different form of developmental learning and should be understood in context. And to get a glimpse of where we are heading with these trends in engagement, we can look to the marketing industry. The idea that over 70% of workers learn more from their colleagues than they do from formal training courses in classrooms or online. While Jay Cross, the author of this informal learning movement did not really focus on the technologies needed for informal learning, he called out the importance of communities, networks, and the role of the internet in facilitating this change in how organizations actually learn. The idea of developmental learning through social interactions mostly thought of as through social networking and social media. These include ideas such as using Facebook to deliver courses, or parts of courses and social learning tools such as Twitter, Jive and Yammer as part of the learning architectures in organizations. And just to confuse matters, the term social collaboration can be considered a subset of social learning whereby participants are learning from each other on their own outside of a course, in informal, unstructured ways (like on Jostle or Yammer). 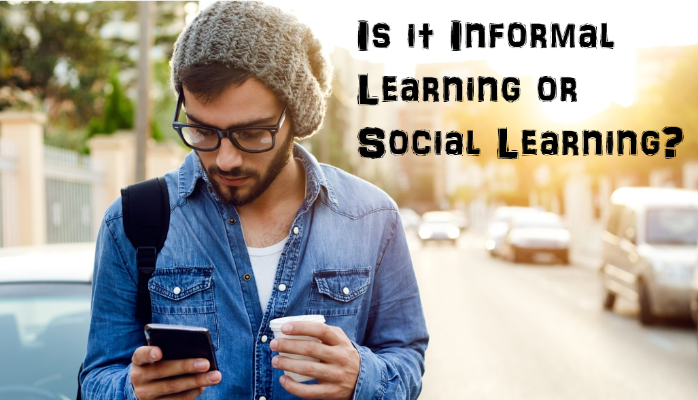 Read more about social learning here. * The modern employee is now adept at social media usage and spends a large amount of time in online environments whether shopping, sharing, communicating, etc. * There is the rise of the modern untethered worker – working from home or in the freelance economy. * The modern workplace is becoming virtual not just in its location, but in its composition. Teams are assembled and disassembled to deliver projects and programs. These teams come from in-company, from specialist support providers and from individual contractors. But providing an environment for learning is not enough, it is the engagement and interaction provided that will bring the learner into the new informal learning environments to share. Learning and Development has a lot to learn from marketing. The buzz around gamification in Learning and Development is as a result of a spillover from the world of marketing. I think back to my days on Doritos and the Crash the Super bowl contests and other methods of providing extrinsic and intrinsic incentives to change behavior. It’s been done, we have tools we can successfully borrow in L&D. Also, L&D has a lot to learn from marketing and in particular digital marketing. The trends that we’re embracing in L&D communication and engagement thinking fall two decades behind what the marketing industry is doing. The opportunity to learn from marketing and marketing-orientated platforms to engage with learners using digital marketing techniques in social and informal developmental learning is probably the easiest development yet to be fully appreciated. Time for meaningful social interactions driven through social media that produces true behavior change.